The tri-national Medium Extended Air Defense System (MEADS) program enters 2015 as a candidate for next-generation air and missile defense requirements in both Germany and Poland. MEADS is a primary candidate for the German Taktisches Luftverteidigungssystem (TLVS), a new generation of air and missile defense that requires a flexible architecture based on strong networking capabilities. 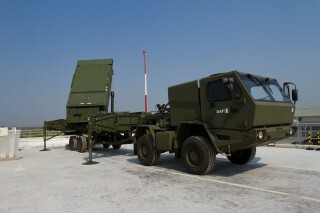 MEADS is also expected to become the basis of a national defense system in Italy. Formal decisions are expected from Germany and Italy early this year, and a follow‐on plan is being developed for transition. In December, the Polish Armament Inspectorate also announced that MEADS International will participate in technical discussions for the Narew short-range air defense system. The Narew system will be capable of destroying aircraft, helicopters, unmanned aerial vehicles and cruise missiles. In December 2014, the MEADS program completed a formal contract review with evaluators from Germany, Italy and the United States. The review completed a recent series of achievements that began with a successful first-ever dual-intercept test at White Sands Missile Range in 2013. In March 2014, the MEADS Mode 5 Identification Friend or Foe subsystem gained final certification for including Mode 5 (L2) capability. In July 2014, at Pratica di Mare Air Force Base in Italy, MEADS demonstrated unique capabilities to network with other systems and radars, share a common integrated air picture, dynamically match interceptors to targets, and to move workload among battle managers. In August 2014, a MEADS Multifunction Fire Control Radar also demonstrated capabilities related to tracking and canceling of jammer signals; searching, cueing and tracking in ground clutter; and successful target classification. The U.S. Army Aviation and Missile Research, Development and Engineering Command has also held a separate review to respond to interest within the Department of Defense in leveraging MEADS technology. MEADS represents a $4 billion effort to develop, implement and prove next-generation air and missile defense system technology. MEADS is designed to defend up to eight times the coverage area with far fewer system assets with significantly reduced demand for deployed personnel and equipment and for airlift. MEADS is also designed for high reliability and needs fewer personnel to operate. MEADS International, a multinational joint venture headquartered in Orlando, Florida, is the prime contractor for the MEADS system. Major subcontractors and joint venture partners are MBDA in Italy and Germany, and Lockheed Martin in the United States. Source: MEADS program management agency NAMEADSMA.